Following Christopher Creed by Carol Plum-Ucci. Review: Have you ever read a website and then wanted to track down a run away person? Well in the fantastic written book titled Following Christopher Creed by Carol Plum-Ucci that is the case. In this book there are two main characters named Mike Mavic and Ray Ann. Mike is a reporter he read a website titled ChistopherCreed.com. He and his girlfriend Ray Ann are investigating the case of Christopher running away from home. It starts in a small town in Indiana. Mike is on the website he visits ChristopherCreed.com- which is run by the "famous" Torey Adams. So since the two college students are on break they decided that they should go to the town were Chris once lived and investigate. When they reach their destination, they are met by some high school students. Who tell them that if they wanted to try to find Chris they should go to Lighting Field where Chris' bother Justin is hanging out. This starts a surreal chain of events as Mike and Ray Ann embark on an adventure filled with death, mystery, and crazy people. If you want to figure out what happens looks like you are just going to have to read the book yourself. 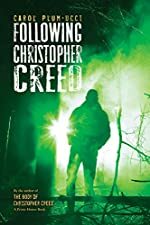 Following Christopher Creed is an amazing book to read. I would recommend this book to anyone 14 and up. The reason I would recommend this book to this age level is because there are some words that aren't suitable for younger kids. So I highly recommend asking your parents to read a couple chapters so they know what kind of words are being used in the book, however the words are sometimes appropriate for the situation, but other times its just bad language. But besides that this book is the best book I have ever read. The plot is very tense which is my favorite type of book. I also think this book is thrilling because everyone in the book is only looking for one person Chris, and Chris is e-mailing Justin to look for him and he appears then vanishes. Even if you don't like mysteries or thrillers I think you will still love this amazing book. The reason is because at first before this book I really preferred sports books. But after I read this book I changed my opinion a lot. I hope that Carol Plum - Ucci makes more amazing books like this. From the beginning I thought this book would be a boring book, but that shows you can't judge a book by its cover. Lastly I think that Following Christopher Creed deserves a five out of five because of all the reasons I listed. So please just read the book- you won't be disappointed. We would like to thank Houghton Mifflin Harcourt for providing a copy of Following Christopher Creed for this review. Have you read Following Christopher Creed? How would you rate it? Great review Ryan! :D Chris must be a very intriging charicter to have reeled in interest. I'd deffinetly like to read this book.